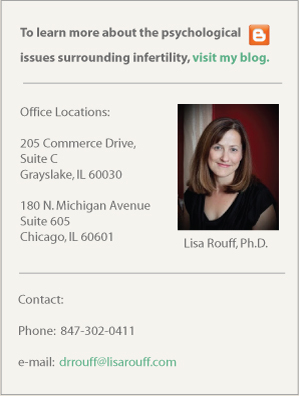 Below are some links that provide useful information about infertility, adoption, and psychotherapy. The American Society of Reproductive medicine website provides medical background and treatment information. National support organization focusing on infertility, adoption, and parenting after infertility. Offers bulletin boards information help-line, support groups, and medical referrals. Another support organization focusing on infertility, adoption, and parenting after infertility. Offers bulletin boards information help-line, support groups, and medical referrals. A collection of links and bulletin boards geared towards those diagnosed with high FSH or who are pursuing donor gametes or adoption. Website of the American Psychological Association, which discusses the role, process, and effectiveness of psychotherapy. Also provides information on various mental health conditions and issues. Website offering information on psychotherapy and therapist referrals.